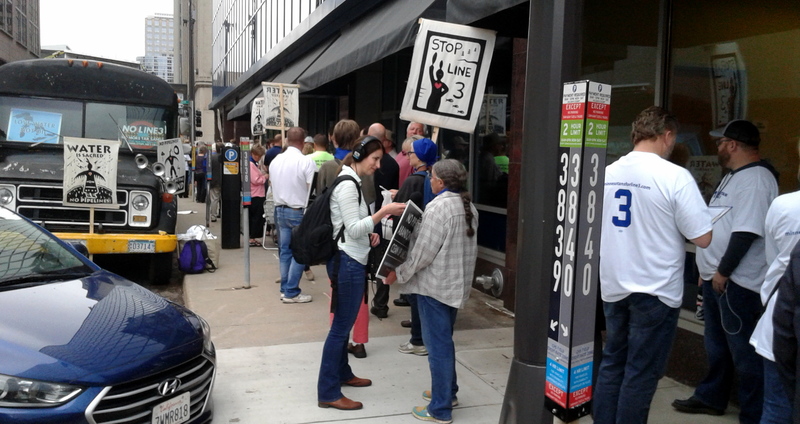 People began lining up two hours before the start of the Minnesota Public Utilities Commission Line 3 hearing in order to get a ticket. 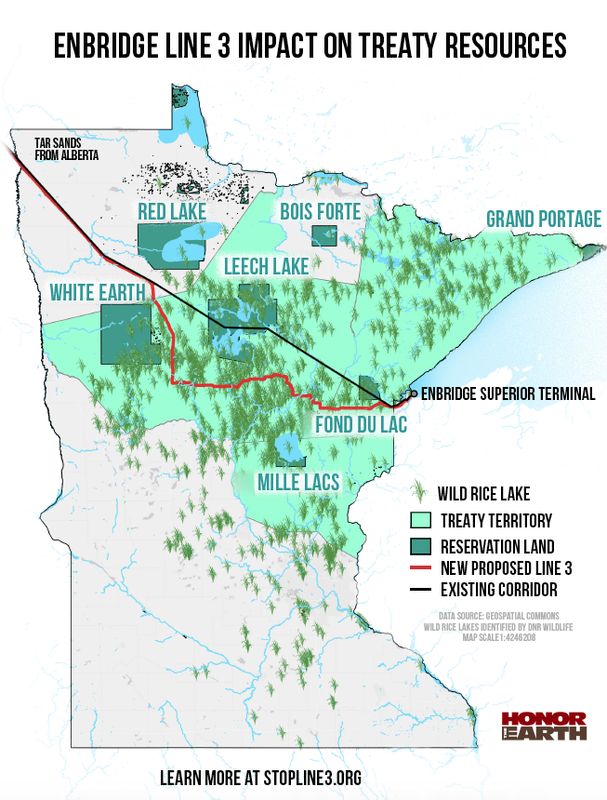 The Minnesota Public Utilities Commission (PUC) today began the first day of the final hearings on the Enbridge Line 3 tar sands crude oil pipeline, with a vote expected later this month. Day One went as well as could be expected for pipeline opponents. The Minnesota Department of Commerce opened with a strong statement — reiterating its position that the state doesn’t need this pipeline. Meanwhile, Enbridge offered a new list of concessions — possibly an indication executives know their proposal is in trouble. The PUC has scheduled additional hearings for Tuesday, and next week on Tuesday and Wednesday. A final vote could happen on any of those days, or the hearings could be extended. The PUC will vote on both a Certificate of Need and a Route Permit. The PUC required people wishing to attend to get tickets to get into the main hearing room and overflow rooms. People on both sides of the debate began queuing up two hours before the hearing started in hopes of getting good seats. Some had signs, some had coffee. The hearing started with opening statements by the intervening parties, with a particularly powerful presentation by Bill Grant, Deputy Commissioner of Division of Energy Resources for the Minnesota Department of Commerce. He renewed the Division’s recommendation, first made last year, that the PUC deny Line 3’s Certificate of Need. Grant said the Division had reviewed Enbridge’s application and thousands of documents and analyzed Enbridge’s energy forecasts. Enbridge is asking you, the Commission, to issue a Certificate of Need and a Route Permit which will relinquish through eminent domain 340 miles of northern Minnesota to a private company. Each of these 340 miles represents the livelihoods, homes, rights, clean water, culture, climate change impacts and people of Minnesota. The state of Minnesota is being asked to give up and place trust in this company and safeguard something more valuable than the price of this pipeline. That is why Enbridge bears the burden to provide the state, and you, proof – data and statistics – not just their word or claims from supporters, that after weighing the evidence, this pipeline is in the public interest and thus is needed. Nine months have passed since the Division of Energy Resources concluded that Enbridge did not satisfy its burden of proof due to the failings of Enbridge’s forecast and future use of its mainline system and the social and environmental harm that would be caused by the construction of a new pipeline. And those failings remain. Enbridge said it would buy renewable energy credits to offset energy use after a new Line 3 is in service. In addition, Enbridge offered to work with those concerned about the old Line 3 to set up a trust fund to decommission all old pipelines in Minnesota. Finally, Enbridge would put a guarantee in place by its parent company, Enbridge Inc., to ensure there would be cleanup money available in the event of a spill. Comment: If Enbridge were truly committed to these goals, it would have offered them from the start. This feels desperate. After the intervenors opening statements, PUC Commissioners began questioning Enbridge and other parties about Enbridge’s energy forecasts — and whether or not Enbridge had met its burden of proof that the pipeline was needed. At times, the debate went into the weeds, with jargon such “apportionment” and “nominations,” part of the esoteric world of how shippers buy and sell crude oil. Other times the debate went global, discussing whether or not initiatives by China and India to boost electric vehicles sales would depress global oil demand. Questions that emerged included whether Minnesota should commit to expanding its fossil fuel infrastructure if the oil market is declining, whether approving the pipeline would run afoul of Minnesota’s energy policies and commitment to reduce fossil fuel use, and whether Enbridge had even done an adequate analysis of future oil demand. The PUC likely will continue the discussion of energy demand on Tuesday. The issue of the “future adequacy, reliability, or efficiency of energy supply” is the first of four criteria the PUC needs to weigh in deciding on whether to approve or deny the Certificate of Need. The second Certificate of Need criterion is whether there is “a more reasonable and prudent alternative” to Enbridge’s proposal. This debate most likely will focus on a Friends of the Headwaters proposal to reroute Line 3 to the south, avoiding the pristine waters of northern Minnesota and running the pipeline through farmland that already had degraded waters. In this part of the debate, the PUC will focus on the threat pipeline spills pose to Minnesota’s environment, the disproportionate harm the pipeline would do to the Anishinaabe people and their treaty rights, and Line 3’s contribution to climate change. If a spill were to occur, there could be significant affects to water resources in a new area where there are currently no pipelines. The environmental impact statement also concluded that there would be disproportionate and adverse impacts to tribal communities if the project were build, no matter which route was used. Over and over during opening statements, Line 3 opponents reminded the PUC that the environmental impact statement found, and Judge O’Reilly’s report confirmed, that Line 3’s “social costs of carbon” would be $287 billion over 30 years. Enbridge completely failed to identify a single benefit of this project that even approaches that number [$287 billion] — even though they have the burden of doing so if they want to build this pipeline. The last Certificate of Need criterion is whether the project complies with all state and federal rules and laws.